J skis now available in malls across North America! 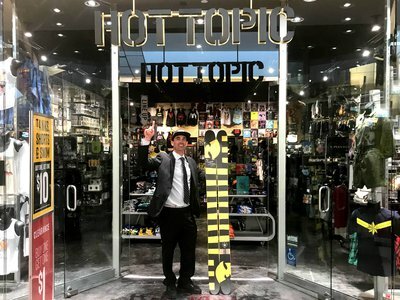 On March 29th, "J Ski Company" completed a 2 year long acquisition deal to acquire the retail chain store "Hot Topic". 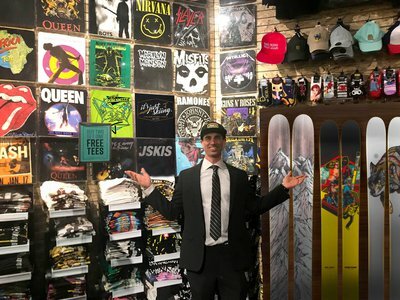 J skis owner and founder Jason Levinthal says, "I couldn't be more excited to be working with one of the most popular retail chain stores in North America! After 5 years of selling exclusively online at Jskis.com, it was time to make the jump to retail. I wanted every skier from Florida to British Columbia to have convenient, easy, local access to our J skis. This is by far the most fitting partner and efficient way to expand distribution." Beginning immediately, J skis will be available in over 800 malls across the US & Canada. The synergies between these two amazing companies are obvious. Both sell popular hoodies and tees that are black, and both of their customers like music. 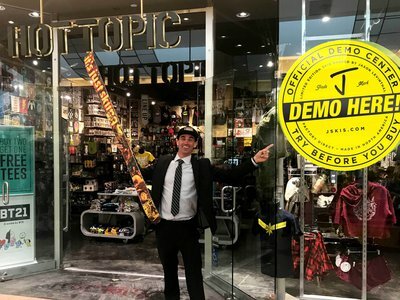 Jason summed it up, "The employees at Hot Topic couldn't be a better fit. They're all passionate skiers with a deep knowledge of the sport and technical know how. They will be able to not only properly educate our customers on goth attire, but also mount bindings and tune skis. Imagine while waiting for your bindings to be mounted, you can conveniently shop for jewelry, jeans and even grab a giant pretzel or meet a friend for lunch in the food court. It's a win win for everyone!" I hope those pictures are real. snowfinder I hope those pictures are real. Are you insinuating this is some sort of a joke? Skiing is serious business! Thanks everyone for the support, see ya at the mall! JLev Are you insinuating this is some sort of a joke? Skiing is serious business! Thanks everyone for the support, see ya at the mall! With brick and mortar retail disappearing this is a bold move. All the best to J Skis in this new venture. Will be interesting to see if other core ski companies follow with similar mergers. Would be fitting for Revision to partner with Sears. J is the hero we deserve. Haha wow April fool's really got me there. Wasn't expecting that one, my goodness! 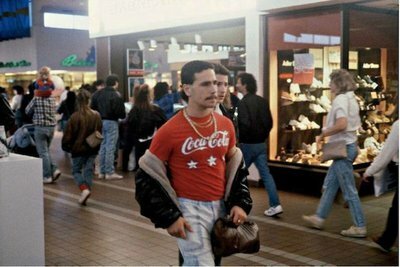 JLev see ya at the mall! Awesome! Now I can get my rick and morty t shirts and coked our ski graphics at the same place! Congrats on dropping 19.7 mil! Need to just open a food truck/ski truck... mounts, tuning, waxing, and burritos. Gimme the loot gimme the loot. Now kids on Newschoolers only have to go to 1 store for all their purchasing needs. I heard they hired Dogfart as head of product testing with this new merger. Thanks Jason, very cool. InfamouslyJones Need to just open a food truck/ski truck... mounts, tuning, waxing, and burritos. Gimme the loot gimme the loot. ^it would make for the only decent store in my vicinity so yeah J save retail then run for president! Everyone needs to go to the online chat at J-Skis and ask a bunch of questions about this to see what they say.